David noted yesterday the tendency of presidential candidates to make Holocaust analogies, but Godwin’s Law isn’t an American monopoly, and in some cases the comparison may be historically apt. It’s just a political issue that is being ramped up by those who can use the excuse of even the smallest community as a threat to the sort of national purity of the state. If you just look back to the Evian conference and read through the intergovernmental discussion, you will see that there were things that were said that were very similar. Indeed, at the time, the Australian delegate said that if Australia accepted large numbers of European Jews they’d be importing Europe’s racial problem into Australia. I’m sure that in later years, he regretted that he ever said this – knowing what happened subsequently – but this is precisely the point. If we cannot forecast the future, at least we have the past as a guide that should wisen us, alert us to the dangers of using that rhetoric. The Evian Conference was held in France in 1938 after the German annexation of Austria to discuss ways to deal with the crisis caused by the flow of Jewish refugees fleeing the Nazis. Delegates from 32 countries, including the U.S., Britain, France, Canada, Latin America, and Australia attended. During the conference, it became painfully obvious that no country was willing to volunteer anything. The British delegate claimed that Britain was already fully populated and suffering from unemployment, so it could take in no refugees. His only offer consisted of British territories in East Africa, which could take in small numbers of refugees. The French delegate declared that France had reached “the extreme point of saturation as regards admission of refugees.” Myron C. Taylor, the American delegate, allowed that the United States would make the previously unfilled quota for Germans and Austrians available to these new refugees. Other countries claimed the Depression as their excuse for not accepting refugees. Only the Dominican Republic, a tiny country in the West Indies, volunteered to take in refugees—in exchange for huge amounts of money. As we know, six million Jews were killed in the Holocaust. Banksy’s politically minded faux theme park Dismaland (which I wrote about here) has captured the public imagination in a way most art installations don’t, attracting about 170,000 visitors and boosting the local economy by about $30 million. Now, after a five-week run in the British resort town of Weston-super-Mare, Dismaland will be repurposed in the form of shelters for migrants and refugees in France. The image above is a screenshot from a new interactive map produced by our friends at Esri, the Geographic Information Systems (GIS) company that has been one of our partners in our American Futures reports. Esri specializes in interactive maps that present information of public, community, or commercial significance in newly comprehensible ways. This latest map, which you can find by going to its home site or checking the embedded version below, dramatizes several aspects of the current crisis, including the routes of in-migration to Western Europe and the dimensions of the problem around the world. There is a lot to see by exploring, and zooming in and out on, the interactive version of the map. I recommend either using the navigation arrows at the bottom of the map below, or starting with the icon in the upper left-hand corner, which will guide you to its component views and sections. 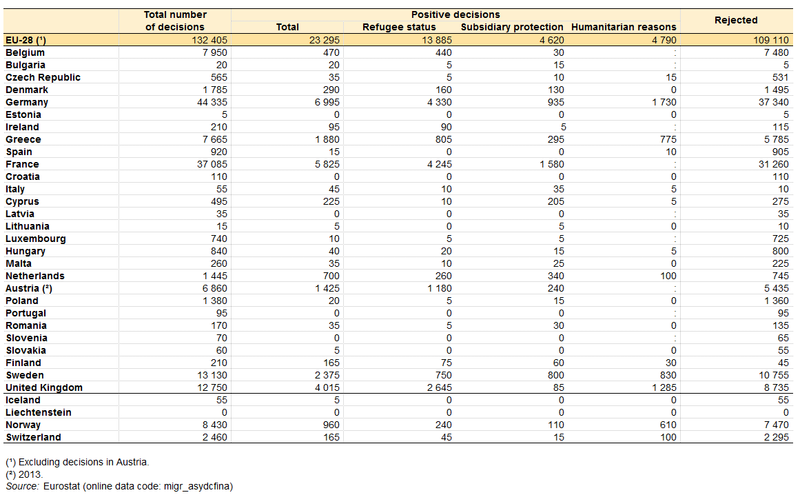 And here is one more screen shot, showing the size of refugee populations in different countries. This is a case in which a (geographic) picture replaces many words. Worth checking out. The first of the many gears that set the march in motion was an internal guideline drafted on Friday, Aug. 21, by Angelika Wenzel, an official at the German migration agency known as BAMF. The guideline, which effectively suspended EU asylum rules for Syrian refugees, wasn’t a change of policy. It was a technical decision—exceptional, but allowed by the rules—aimed at speeding up asylum application reviews in the face of more arrivals. It didn’t even require approval from the Interior Ministry and was aimed only at BAMF’s 36 field bureaus around the country. In the absence of an official confirmation, though, Berlin’s new stance wasn’t widely communicated. The Aug. 25 tweet from the agency changed that. Within hours, the news was picked up by the world’s media and quickly went viral. Nearly a month later, that message is still having repercussions. Hungary, which had become the main transit point through which migrants tried to reach Germany, closed its borders to them. Today, as I reported earlier, Croatia said it was unable to cope with the flow, stranding 15,000 migrants—many of them headed to Germany because of a tweet. How Much Does It Cost to Resettle a Syrian Refugee in the U.S.? The short answer: It’s about $15,714. 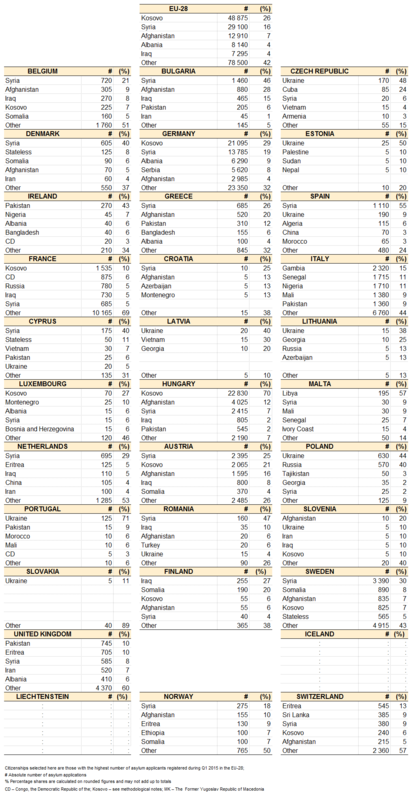 Last year, the U.S. took in 70,000 refugees. Secretary of State John Kerry wants that number to increase to 100,000 next year. At least 10,000 of those refugees will be from Syria. The process of bringing refugees to the U.S. is handled by three agencies: the State Department, which leads the program, USCIS at the Department of Homeland Security, and the Office of Refugee Resettlement at the Department of Health and Human Services. That includes the cost of overseas processing and the domestic resettlement pieces, so from the beginning all the way to programs for which refugees are eligible up till five years after admission. And, as the official pointed out, the process is long: It takes anywhere from 18 to 24 months or even longer to process a case from referral or application to arrival in the U.S. The Syrian refugees who are likely to come to the U.S. in the next fiscal year are in various stages of that process. Updated on September 10 at 2:51 p.m. The White House says the U.S. will take at least 10,000 Syrian refugees in the next fiscal year, which begins October 1. That’s after The New York Times reported this morning that the U.S. may take as many as 100,000 refugees worldwide next year, up from the current limit of 70,000. That figure, reportedly revealed by Secretary of State John Kerry to lawmakers at a meeting Wednesday, comes amid a heated debate in Europe on how to distribute 160,000 asylum-seekers among the EU’s member states. The numbers are undoubtedly large, but they pale in comparison to the scale of the problem—and what other, sometimes much poorer, countries are doing in response. Worldwide, the U.N. says, nearly 60 million people have been forcibly displaced. Of that number, 38.2 million are internally displaced, 19.5 million are refugees, and 1.8 million are asylum-seekers—people who says they refugees, but whose claims haven’t been validated. 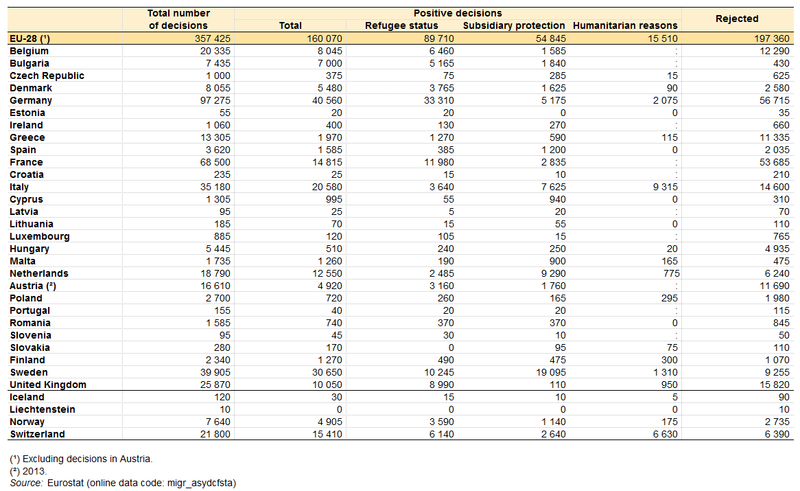 The top six countries to host refugees are Turkey (1.59 million), Pakistan (1.51 million), Lebanon (1.15 million), Iran (982,000), Ethiopia (659,500), and Jordan (654,100). In comparison, the U.S. accepts 70,000 refugees a year. The policies of individual EU states vary, but the bloc is struggling to forge a coherent position on the crisis, which has been exacerbated by the Syrian civil war. The incident happened in the town of Roszke in southern Hungary, close to the Serbian border, as refugees broke through a police line at a collection point. The woman has been identified as Petra Laszlo. The station she was on assignment for is affiliated with Jobbik, Hungary’s far right party. As we detailed for you this morning, German Vice Chancellor Sigmar Gabriel says his country will accept 500,000 asylum-seekers a year for the next several years. In other words, Germany grants asylum to about 41 percent of all first-time applicants. So, Germany grants asylum to about 16 percent of those who appealed their initial rejection. Syrian applicants have a better chance of getting asylum in Europe: 94 percent of applicants were granted asylum across the EU in the first quarter of this year. That figure was even better in Germany: Of the 13,785 Syrians who applied, 13,775 were granted asylum—a more than 99 percent success rate. Images like this of migrants trying—and sometimes dying—to reach Europe have drawn international attention to the crisis, along with criticism that countries are not doing enough. Here are some voices of European officials, citizens, and of the migrants themselves. Germany’s Chancellor Angela Merkel’s voice is a powerful one within the European Union. Her country has accepted more refugees than any other in the region, and on Monday, announced it would set aside 6 billion euros to help refugees. “If Europe fails on the question of refugees, if this close link with universal civil rights is broken, then it won’t be the Europe we wished for,” Merkel said. British Prime Minister David Cameron is among those who has argued that Europe cannot cope with the unprecedented numbers of refugees seeking a place to live—though he has appeared to relent under pressure. On Monday, Britain said it would accommodate 20,000 refugees from Syria. “I don’t think there is an answer that can be achieved simply by taking more and more refugees,” Cameron said last week. Hungarian Prime Minister Viktor Orban, whose country has become the focus of the crisis, is one of the strongest critics of accepting migrants. Many Europeans want their governments to take in more refugees. In Iceland, author Bryndis Bjorgvinsdottir set up a Facebook group as an open letter to Iceland’s welfare minister to show the country can cope with migrants. Eleven thousand Icelanders in the group offered their homes to Syrian refugees. “They are our future spouses, best friends, the next soul mate, a drummer for our children’s band, the next colleague, Miss Iceland in 2022, the carpenter who finally finishes the bathroom, the cook in the cafeteria, a fireman and television host,” Bjorgvinsdottir wrote. One local volunteer, Dániel Szatmáry, said the first afternoon he planned to help for half an hour, but ended up staying all night. “We can hear their stories: an 18-year-old Syrian guy told me that he had left because his parents and three sisters had been killed,” he said. But there are European opponents, too. Hundreds gathered in German towns to condemn their entry, shouting “foreigners out” and throwing rocks and bottles. In the Icelandic Facebook group, some commenters demanded that incoming refugees denounce ISIS in writing before being allowed into the country. Jenan Moussa, the journalist, hosted a Twitter conversation with Abu Yazan, a Syrian man planning his journey to Europe. I spoke with Lu Al Ghina, a Syrian woman who left to live with cousins in the U.S. She described her aunt Laura’s recent journey from Syria to Europe where she arrived Thursday. Her aunt, she said, left Turkey—aided by smugglers—in a rubber boat, and arrived in Greece. From there, they sailed to Bulgaria and crossed fences to reach Germany. She says her aunt will stay in Germany until things improve in Syria. Abu Yazan was less optimistic. President François Hollande of France announced on Monday that his country would take in 24,000 asylum seekers over two years, Britain said it would take in 20,000 refugees from Syria, and Chancellor Angela Merkel said Germany would set aside 6 billion euros, about $6.7 billion, to deal with the crisis. Much of the coverage is about the massive scale of the dislocation: “waves” of asylum-seekers flowing into European countries in a “relentless stream.” But journalists have also given us several powerful glimpses from the view of individuals affected by the crisis. When [an 18-year-old Syrian refugee named Monahad] set foot on Hungarian soil, walking past a pair of police officers who barely glanced in his direction, he let out a laugh. In a field 500 metres north of Hungary’s border with Serbia, Mouti, a 50-year-old oil engineer, points at the muddy field around him. Several hundred mostly Syrian refugees have been camped here overnight, surrounded by a thin blue circle of Hungarian policemen. They’ve slept in the cold, if they’ve slept at all. A man lies unconscious, roused only by a splash of water. Mothers rock their babies, looking miserable. One brother was holding an umbrella, to shade himself from the noon sun. The other was holding up a color photograph of Angela Merkel, the German chancellor. It was March 7, 1979, and you needed special permission to leave the totalitarian country; passports were issued only to those who could prove they were returning. That meant that anyone who tried to leave for good was forced to break the law, and the consequences for getting caught made the decision to leave as final and harrowing then as it is today for the thousands of migrants arriving on Europe’s shores. For weeks leading up to our departure, my mother talked loudly about the plans she had for expanding the balcony of our Bucharest apartment. She also cashed in her savings to buy a color TV, the first our family had owned, in the hopes that the Securitate agents assigned to track our family would be fooled into thinking we planned to return. My father agreed to stay back, sacrificing himself in an effort to make it appear as if the family were still rooted in Romania. The night of our departure, I lined up my stuffed animals and “interviewed” them to find out which ones wanted to come with me to Paris. I decided they all wanted to come, and so I shoved them into a suitcase and struggled to zip it shut, only to be scolded by my mother, who said I could take two at most. I chose a doll and my stuffed rabbit, and then when she wasn’t looking, I slipped in a miniature elephant and several coloring pencils. Pope Francis wants European parishes to offer shelter to migrant families. “Every parish, every religious community, every monastery, every sanctuary of Europe, take in one family,” he said in today’s Angelus at St. Peter’s Square. Europe is seeing the largest flow of migrants since World War II, and that flow has been accompanied by tragedy. Their long march from Hungary toward Germany has prompted both large shows of welcome, as well as opposition. As we witness the “tragedy of tens of thousands of refugees that flee death in conflict and hunger and are on a journey of hope, the Gospel calls us to be close to the smallest and to those who have been abandoned,” the pope said in his prayer today. The European Union, which operates by consensus among its 28 member states, is debating what to do, but considerable resistance remains among central European states like Poland, Slovakia and the Czech Republic, as well as from Britain, to accepting mandatory quotas of migrants, as France and Germany have proposed. Chancellor Angela Merkel of Germany has been praised for her moral leadership for saying that all Syrian migrants would be allowed to come to Germany and apply for asylum. But some have argued, like Mr. Orban and Prime Minister David Cameron of Britain, that simply opening the European door will cause many more thousands of migrants and asylum seekers to abandon refugee camps in Jordan, Lebanon and Turkey, and embark on the hazardous and expensive journey to Europe, promoting more people smuggling, and not less. I’m going to avoid writing “migrant” when, I suggest, we should be saying “refugee.” There is a burgeoning online campaign here trying to persuade the BBC to do the same. The difference between talking about migrants and refugees matters. The UNHCR defines a refugee as one who “owing to a well-founded fear of being persecuted for reasons of race, religion, nationality, membership of a particular social group or political opinion, is outside the country of his [sic] nationality.” According to some, many of Europe’s refugees are not that; they are economic migrants. This needs challenging. To label someone a migrant demands much less of you than a refugee would, be that legally or morally, on this thinking. We need to recognize this fact. Perhaps they do indeed pose a threat to our culture. If that’s a culture of individualistic and materialistic selfishness, maybe such a threat is no bad thing? For now, at least. Thousands of migrants who were holed up in Budapest’s Keleti railway station this week arrived at the Austrian border early Saturday, the AP reports. By the afternoon, 5,000 had made it to Austria and Germany. The train station looks very different now, but hundreds more, fleeing their homes to escape war and poverty, are expected to cross into Hungary this year. By Thursday of this week, more than 3,000 people crowded the transportation hub in Hungary’s capital. Hungarian officials suspended train service from the station to Austria and Germany—the countries that most migrants are trying to reach—and attempted to move people to government-run refugee centers in Hungary. The migrants refused to go anywhere but west, and by the end of the week, Hungarian officials were overwhelmed. On Saturday, Austria and Germany agreed to open their borders to the refugees in “an attempt to solve an emergency situation,” the AP reports. Hungarian buses transported thousands of migrants to Austria this morning. Many boarded trains there, bound for Austrian and German cities, including Vienna, Salzburg, and Munich. When the first 400 migrants and refugees arrived in Vienna, charity workers offered a wide choice of supplies displayed in separately labeled shopping carts containing food, water and packages of hygiene products for men and women. A mixed crowd of friends and Austrian onlookers cheered their arrival, with many shouting "Welcome!" in both German and Arabic. One Austrian woman pulled from her handbag a pair of children's rubber rain boots and handed them to a Middle Eastern woman carrying a small boy. About 4,000 migrants crossed into Austria from Hungary by mid-morning, according to Austrian police spokesman Helmut Marban. Vienna city official Roman Hahslinger said 2,300 had arrived in Vienna by midday. And officials in both Austria and Germany said the unregulated flow of migrants Saturday from Hungary meant that up to 10,000 might cross by nightfall. German officials said Saturday that Hungary, as a member of the European Union and an early stop on many migrants’ journeys to other nations, needs to do more to persuade people to file asylum papers there. German Chancellor Angela Merkel said that her country would not impose a legal limit on the number of asylum seekers it might accept. Earlier this week, Hungarian Prime Minister Viktor Orban called the refugee crisis “a German problem.” Hungarian officials said Saturday they won’t be providing bus services for migrants again.